One of the earliest motivations for my work on the Raspberry Pi SPI driver was so that I could use some Digi XBee ZB SMT modules. These are basically the same as the normal XBee ZB modules for doing ZigBee with but are on little PCBs that you solder onto a carrier boardâ€”and they can speak SPI to the host processor instead of serial. I got several of these modules for a previous project that never materialised but the Raspberry Pi seems like a nice environment to have a play with these. 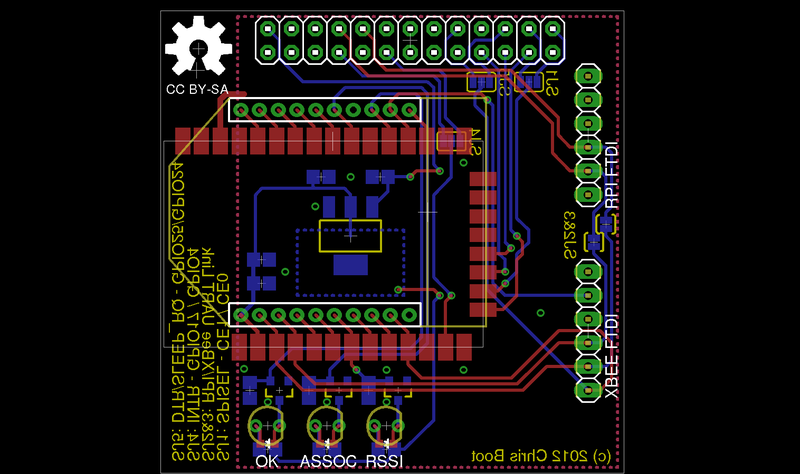 So I went ahead and designed a carrier PCB to hook these up to the Raspberry Pi’s GPIO expansion connector. You can see an Eagle exported image of the PCB to the right. It carries the XBee ZB SMT along with a bunch of LEDs and its own 3.3V LDO so it doesn’t draw too much from the Pi itself. I also threw in two FTDI connectors, one for the Raspberry Pi’s UART and one for the XBee module’s. It also sports a set of holes for the normal XBee modules (2mm headers) so you can use those as well over serial, but obviously you won’t be able to use SPI with those. You can find the source Eagle files along with the associated libraries over in my RPi-XBee-SMT Git repo at GitHub. 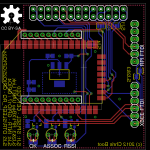 I’ve decided to release this under a Creative Commons Attribution-ShareAlike 2.0 UK: England & Wales License, making it Open Source Hardware (OSHW). I haven’t yet ordered any PCBs of this, so I haven’t actually tried it out yet. 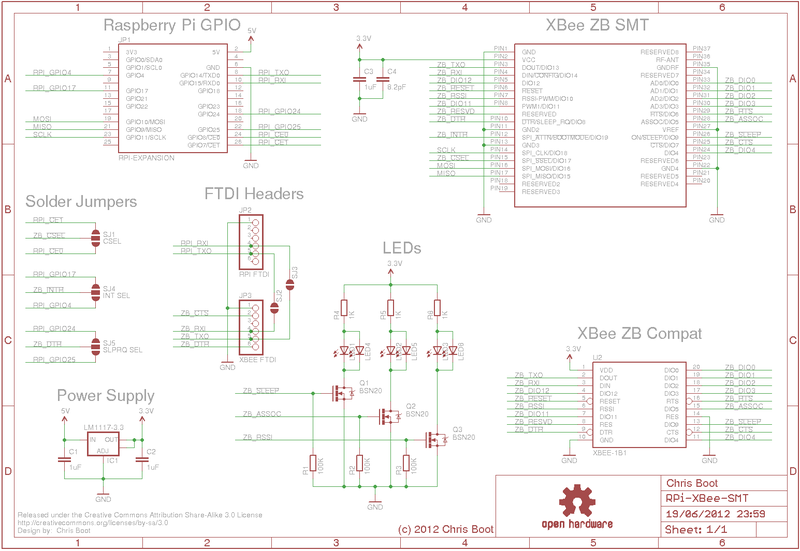 If you have any comments on the schematic or layout then please let me know. I’ll try to get some ordered in the next couple of weeks – if you live in the UK and would like some yourself it may be worth pooling the order to get the price down so please comment / email if that’s the case. I would recommend the services of these guys: http://www.spiritcircuits.com/services/go-naked (I have no affiliation with them), to get your prototypes made up for free! 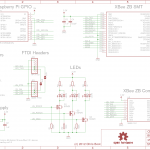 I have used them to make my own XBee and ProBee expansion boards for Raspberry Pi. We are desperately needing this type of solution for our rasberrypi “dock”. Is there any plans on writing the driver for this board ? If we can help contribute to making this happen , we would be happy, as it would be of great value to us, to assure this gets completed.